The United States has an abundance of natural gas that pollution-riddled China badly needs to wean itself off coal. Eying China’s voracious demand, Cheniere Energy, ExxonMobil (XOM) and other American energy companies are racing to build more than two dozen expensive facilities to export liquefied natural gas, which is super-cooled natural gas that can be transported by ship. China even marked President Donald Trump’s visit to Beijing last fall by agreeing to invest as much as $ 43 billion into an LNG project in Alaska. But this pairing of an able buyer and well-supplied seller no longer looks like a slam dunk. As part of the escalating trade war, China on Tuesday said it will impose a 10% tariff on $ 60 billion of US products — including LNG. The trade tensions could make it more difficult for the next wave of LNG export facilities to get the financing needed to get off the ground. “It’s obviously very concerning. The potential for some projects to get delayed is very real,” said Charlie Riedl, executive director of the Center for Liquefied Natural Gas, a trade group that represents Exxon, Chevron (CVX) and other energy companies. The shale boom created an excess of natural gas in the United States. 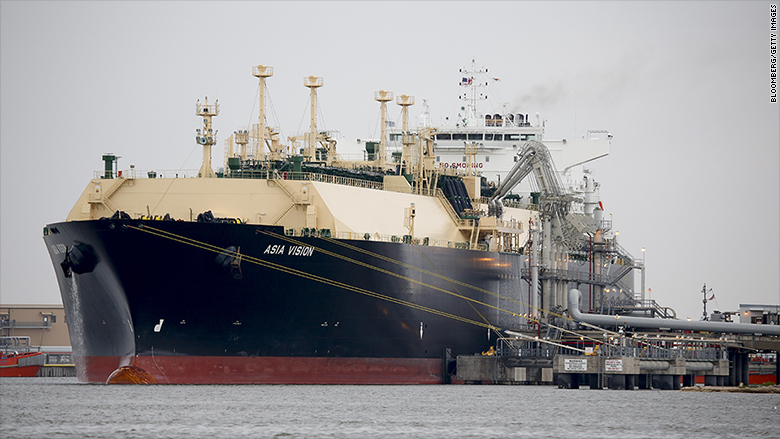 In a bid to get rid of the glut, the United States began exporting LNG in 2016 when Houston-based Cheniere (LNG) opened the Sabine Pass terminal in Louisiana. Earlier this year, Dominion Energy (D) opened Cove Point in Maryland, the nation’s second export facility . China is the big elephant in the room. 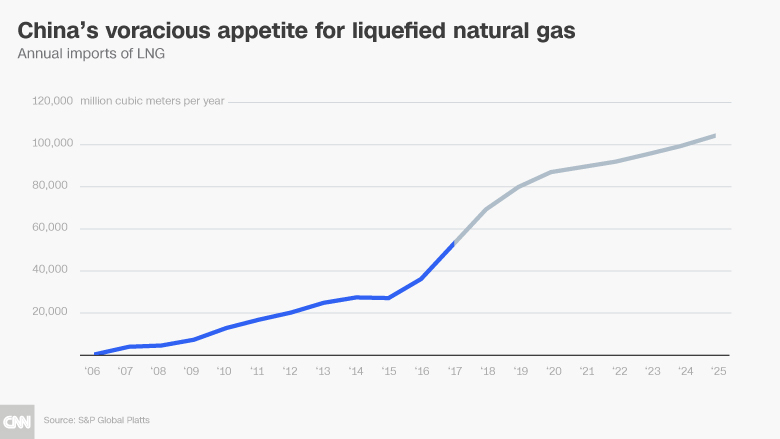 China’s appetite for LNG is growing rapidly. And it’s on the verge of overtaking Japan as the biggest buyer of LNG in the world. That’s one major reason why the United States is planning to quadruple its export capacity by building at least 25 new facilities. LNG is a centerpiece of Trump’s energy dominance agenda. In the 12 months leading up until June 2018, China was the second-largest buyer of US LNG, according to energy consulting firm Wood Mackenzie. Shell, the US subsidiary of Royal Dutch Shell (RDSA), was the largest seller. However, China has dialed back its US LNG purchases in recent months as trade tensions have ratcheted up, according to ClipperData. Beijing is instead turning more to LNG powerhouses Qatar, Australia and Russia. “China has been able to find willing sellers closer to its own backyard,” said Matt Smith, ClipperData’s director of commodity research. Now, the tariffs will likely price US LNG out of the Chinese market, according to S&P Global Platts. 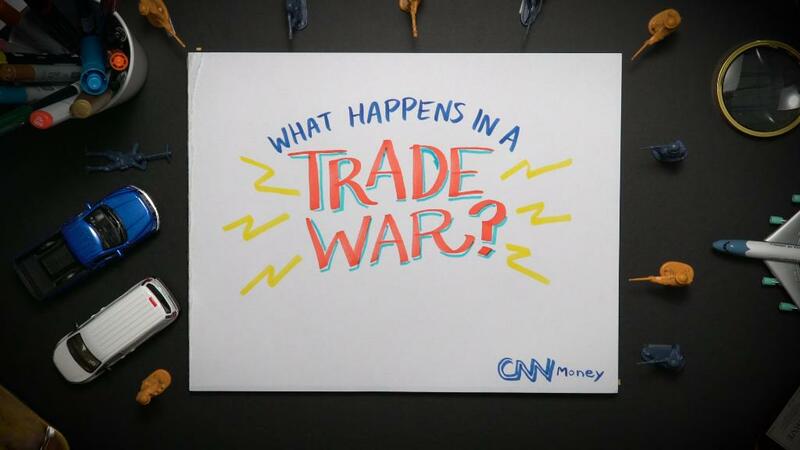 “There are other suppliers around the world that would gladly supply China — and they don’t have a 10% tariff,” said Riedl. The good news is that China had threatened an even bigger tariff — 25% — on US LNG. Cheniere’s share price rallied 2% on Tuesday in response to the lower-than-feared rate. In any case, analysts don’t believe that overall US LNG exports will be dramatically hurt in the short run. There are plenty of other buyers, including Japan, South Korea, Taiwan and Latin America. And Washington has been pushing Europe to break its addiction to natural gas from Russia. The real fallout of the US-China trade war could be felt in that next wave of LNG projects that’s in the works. Due to the enormous cost to build each facility, financing hinges on the ability to sign a long-term buyer to a contract. And the obvious buyer had been China. Until now, that is. For instance, Cheniere announced plans in May to expand its Corpus Christi export terminal in Texas. The expansion was backstopped in part by a contract with PetroChina (PTR). Cheniere did not respond to a request for comment on the impact of the tariffs from China. In August, Cheniere CEO Jack Fusco told analysts that threatened tariffs from China may slow down talks with counterparts in China about future growth. However, Fusco said that the tariffs won’t impact existing contracts. And he emphasized that the US-China energy relationship has been beneficial to both sides, including by creating thousands of direct and indirect American jobs. Will Republicans kill the estate tax?